MDS is always looking for ways to save our customers money and for ways to show how much we appreciate the business. But first, you need to place an order with MDS and become an active customer. Then when you reorder we will thank you for your support with a $10 gift card of your choice when you place an order over $149 (order $298 and receive $20 etc.). Redeem coupon code FREEGIFTCARD. 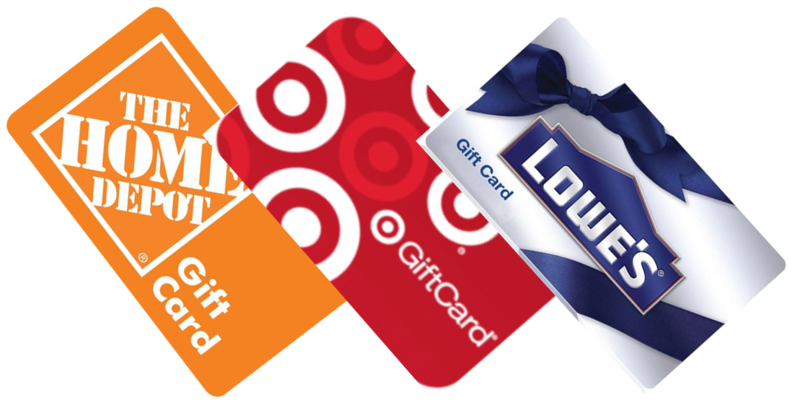 Let's face it, everyone loves gift cards and we have selected three of the most popular retail outlets for you to enjoy. Select from Lowes, Target or Home Depot. Use for your own, share with staff or use these as an incentive. Details: Minimum order must be over $149 (any sales tax and shipping is not included). Allow up to 4 weeks for delivery. Can't be used with any other coupons, offers or discounts. Cards will be mailed to billing address provided when you place an order unless otherwise noted. This promotion applies to phone orders or orders placed on-line. Please enter coupon code FREEGIFTCARD in shopping cart. For over 30 years our family business has built a reputation for No Gimmicks / No Frills / No Bait and Switch. We strive to offer the lowest price, best value on the internet. If you find a current lower price on an identical, in-stock item from any competitor, we will either match the price or beat it. We Realize You Have a Choice...Thank You for Selecting MDS! Please contact us with questions, for samples or to place an order today!